Fig. 1. 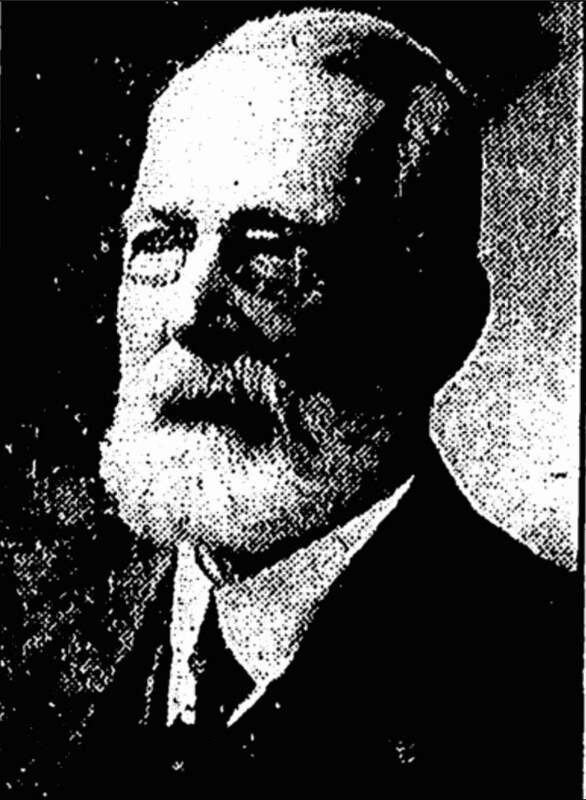 Benjamin H. Collins c. 1925-1928. Benjamin Hudson Collins (1845-1928), was born on May 18, 1845 at Philadelphia, Pennsylvania, son of William Collins (1815-1878) and Mary Anderson Collins (1820-1905), both natives of Delaware. According to his obituary he purportedly moved to Independence, Missouri, but no corroborating evidence has been found to support this, suggesting it is an error regarding the location of the death of his eldest son in 1893. He served in the Civil War in Company E, New York 158th Infantry Regiment from December 23, 1863 to June 30, 1865, at Fort Monroe, Virginia. He was wounded September 29, 1864. He was transferred to New Orleans where he purportedly worked as a scout under General Philip Henry Sheridan (1831-1888). After his duty under Gen. Sheridan he was again transferred to General G. O. Howard at Washington, D. C. and Maryland, assigned duty in the Freedmen's Bureau. In 1869, he was still working as a clerk in the Freedmen's Bureau at Baltimore as a civilian. About June 1871 he began to work as a clerk for the Treasury Department and eventually became the chief of the tobacco division of the Bureau of Internal Revenue in June 1890, succeeding Israel Kimball. In 1875 he married Katherine "Kate" Hayden (1855-1917) and they had two sons. Sometime after the Civil War Collins assembled a vast collection of 2,500 specimens of Confederate paper money, which eventually was bought by Charles M. Williams, and insurance salesman at the time (later as heir apparent made vice president of the Western and Southern Life Insurance Company of Cincinnati and president in 1950); later on in November of 1955 it was sold by Abe Kosoff at Encino, California. In 1883 he began to buy and sell coins and collectibles with the Chapman Brothers of Philadelphia, Pennsylvania. The 1889 and 1890 Washington D.C. City Directories lists him as a Numismatist located at 610 14th Street, N.W. It is purported that in 1891 Collins bought a gem 1793 S-2 at the coin shop of W. S. Lincoln & Son, London, though no passenger list has been found to support this opinion. That same year he proposed that a commemorative coin be issued for the centennial of the U. S. Mint. In 1892 he sailed to Rotterdam and back to New York on 10 August, 1892, aboard the Spaarndam. His son Benjamin Perry Collins (1874-1893) died at St. Louis in November, 1893. In 1894, it is purported by Walter Breen et alia that he acquired a bag of about 1,000 uncirculated 1828 13 stars half cents. The story gets muddled or perhaps conflated with another about an 1811 half cent also said to be uncirculated that was in the same bag. According to that version of the account Collins was given the 1811 half cent first thinking the entire bag was of the same denomination, date and condition and sold it at a bargain price to the Chapman Brothers telling them he had a bag full. Regardless, in December 1899 he told John F. Jones the hoard numbered about 50 half cents. Dave Bowers, American Coin Treasures and Hoards has the best description and analysis of the coin hoard to date, except his doubting the date 1884 when Chapman claimed it was first discovered and offered to them. Although Collins was an employee of the government in 1884 he was already very active as a client of the Chapman Brothers buying and selling coins and stamps for about a year. Neither Dave Bowers nor anyone else for that matter were privy to this information nor to the myriad of other numismatic secrets since they are accessible only in the Lupia Numismatic Library, Special Collection, The Chapman Family Archive. Fig. 2. Postal Card sent by Collins to the Chapman Brothers postmarked February 12, 1884, Washington, D.C. Courtesy Lupia Numismatic Library, Special Collection, The Chapman Family Archive. "Have this day Adams Expressed you Complete Set Private Die Int. Rev. Stamps--with Duplicate Invoice of owner. These Stamps are all perfect not disfigured by cancellation & are rare. Let me hear from you promptly. Also returned Proof 1858 Dime, too high, have an uncir'd will make that do. 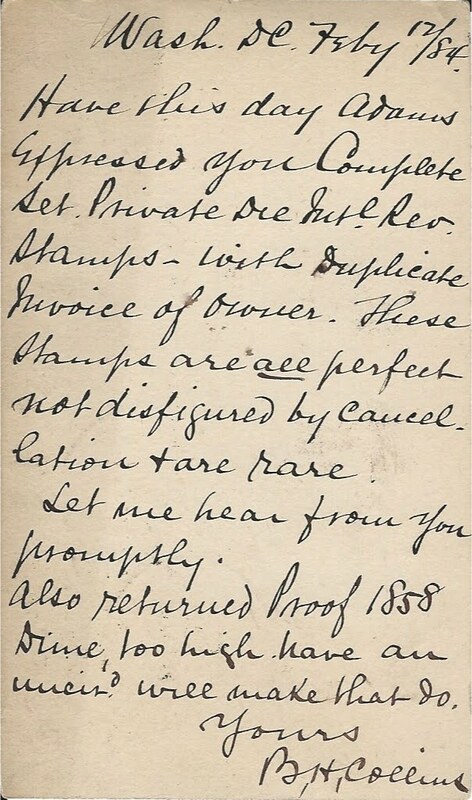 It is clear from this letter Collins was both buying and selling collectibles in the early 1880's. He retired from the government in 1894 when he became a full-time Washington, D.C. coin and curio dealer specializing in American coins, especially large cents and half cents at his shop at Seventh and Eleventh Streets. His mailing address was 821 17th Street, N. W. Washington, D.C. He remained there until 1926. In 1895 the ANA convention was held at the home of Collins at 1106 G Street, Washington, D. C.
"From Baltimore we journeyed to Washington. There a Mr. B. H. Collins, who was many years in highly responsible positions under Republican administration, has been persuaded by President Cleveland to devote himself entirely to longstanding personal predilections for the purchase and sale of coins curios, gems, antique jewelry, rare glass, paintings, and a variety of aesthetic objects. His business parlors are on the first floor of his dwelling in the best business section of the city and are full of interesting things of preceding classification. Mr. Collins is prematurely grey, but of animated and very social disposition, and his experience, remarkable memory, and great enthusiasm make his shop very interesting. His private collection of cents is doubtless the best that exists." In 1896 he acquired the uncirculated 1796 15 stars half dollar. In May of 1896, The Brooklyn Daily Eagle reprinted an article from The Philadelphia Times : “Not long ago, B. H. Collins, a dealer in this city, bought at a sale in London 128 copper cents and 47 half cents for $1,500. Since then he has sold a part of the lot for $2,100 and he has $800 worth left.” This report ran after he bought out the stock of W. S. Lincoln & Son. On March 2-3, 1897, Ed Frossard’s 144th sale, auctioned his collection of U. S. Cents and Half Cents. On May 28, 1901 he auctioned off at C. G. Sloan & Co., N.W. Washington, D.C., a vast collection of rare art, jewelry, furniture, etc. Fig. 3. Postal Card sent by Collins to the Chapman Brothers postmarked February 3, 1904, Washington, D.C. Courtesy Lupia Numismatic Library, Special Collection, The Chapman Family Archive. When your delayed postal inquiry was rec'd the $5 Baldwin was out on approval, hence I could not reply sooner than now. I am just in receipt of letter accepting same & I have disposed of it very satisfactorily. 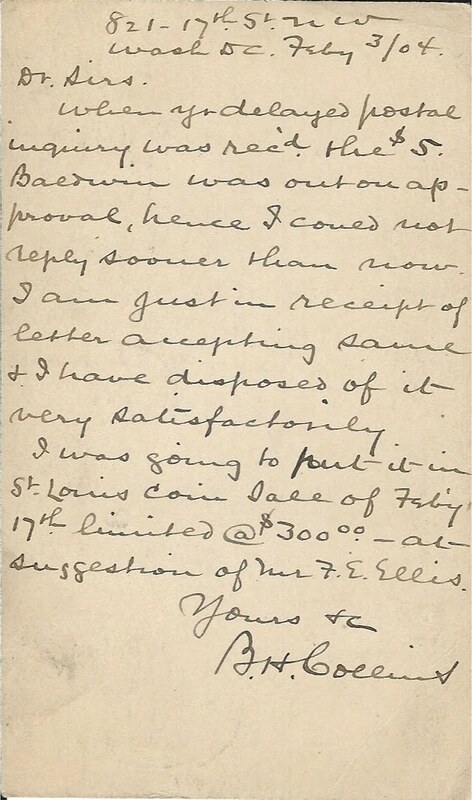 I was going to put-it-in St. Louis Coin Sale of Feb'y 17th limited @ $300.00 -at- suggestion of Mr. F. E. Ellis. The Baldwin & Co., San Francisco, California, 1850 $5 gold piece is very rare. It was minted around the time California was admitted as the 31st state in the United States of America on 9 September, 1850, as a "free state," i.e., without slavery, as a result of "The Compromise of 1850". This private gold piece is significant for its rarity and historical value. Apparently the Chapman Brothers responded to some notice about obtaining it, but, Collins reports they took too long and were too late since he already had the piece out on approval at the time and the client purchased it at an amount that suggests more than $300. Frank Elmer Ellis (1861-1937) was the founder of St. Louis Stamp & Coin, whom Collins also reports suggested to him to put the piece in his 7th coin auction sale slated for February 17th, 1904. This particular note is significant since it reveals how three dealers behaved about an important coin transaction. Ellis was pragmatic looking for a sure sale. The Chapmans played it coy and cool to low ball as usual and lost out completely. Collins taking the cue from Ellis knew the high end value and most probably shot a bit higher when he had his fish caught on his line. He simply reeled him in. In March 1905 issue of The Numismatist a letter sent to The Washington Times was republished by George Heath who gave a bad opinion of Collins implying he was a derelict. Fig. Collins exhibited his Large Cent collection at the ANA convention of 1910. Journal, Thursday, September 15, 1910. In January 1919 he acquired the gem 1800/1798 First Hair Style Large Cent. He died from complications of a fractured hip sustained from a fall in February 1926. He was feeble due to this injury yet managed to attend the ANA convention of 1926 held at Washington, D.C. He passed away in the Washington Sanitarium, Tacoma Park, on Sunday, April 29th, 1928. He was nineteen days short of his 83d birthday. He is buried in the Oak Hill Cemetery. He was survived by his son William Hayden Collins (1878-1950), and his grandson Benjamin Perry Collins (1911-1970), both of Washington, D.C. He left his coin collection to his grandson Benjamin Perry Collins upon his twenty-fifth birthday if and only if he developed an interest in numismatics and collecting to be determined or judged by B. H. Collin's son, William Hayden Collins, the father of Benjamin Perry Collins. Otherwise his September 20, 1926 will allowed his son to direct a sale and dispose of the money as he sees fit. As it is well known his remaining large cent collection contained the finest specimens, which eventually was acquired by B. Max Mehl in 1937, when Benjamin Perry Collins was 26 years old. Collins left his coin collection to his grandson as a grand-paternal gesture, i.e., a grandfather's doting love for his grandson leaving him something that was special to him with the hope the same love of numismatics and collecting would be instilled in him, thereby passing on something beyond mere monetary value. He was a member of the Burnside Post GAR. ANA Member No. 76, and ANA Member No. 192. His extensive collection of antique jewelry, gems, etc., was first consigned to the “Hobby Shop”, N.W., Washington, D.C., six months after his death. Most of it went unsold. On December 4, 1934 that same collection of rare stone, gems, ivory, antique watches prints, etchings, etc., was auctioned at Weschler’s Auction House N.W., Washington, D.C.
“The Value of Old Coins,” Brooklyn Daily Eagle, Sunday, May 31, 1896, page one, column 3 top.